It is commonly accepted that "Ceallach" or Kelly as it appears in English means "War" , "Strife", "contention", or "bright head". The family surname O'Kelley means "descendant or grandson of Ceallach (Kelly)" and more than one native Irish has informed me that my last name's double "e" spelling has never been used in Ireland but I have discovered evidence that the spelling of many Irish names and words into English were determined by the time period and circumstance when they were translated from Gaelic into English and the earliest translation of our name was "Kellie", "Calley","o Kelley", "O Killia" and later sometimes "O'Kelley" and of course when English was reduced to remove a lot of unnecessary letters mostly the extra "e" it was translated into O'Kelly. I think it worth of mention that my ancestor arrived in American in 1748 with his Irish surname of "O Kelley" intact and the 1815 Estate Records of my 4th great grandfather Charles O'Kelley prove that my family was using O'Kelley in 1815. His grandfather came from Ireland with the story that he was from Co Meath and descend from the "Old Kings of Ireland". While it is commonly believed that all O'Kellys and O'Kelleys originated from Ceallach of the Hy-Many O'Kellys, Ceallachh was a common name and the Kelley DNA Project has proven there are many lines of Kelly and O'Kelly who did not originate from the Hy-Many O'Kellys. The O'Kelleys of Co Cork, Waterford, Meath, Dublin, and even Tyrone appear in the early records as double "e" Kelleys and most reduced their name to Kiely or Kelly. It seems certain that the lines of O'Kelley who lived closest to Dublin were more likely to use an English spelling in the time when extra letters mostly extra "e" were in use so I am certain that our double "e" spelling is one of the earliest translation of Ceallaigh into English and the single "e" spelling is the later more modern and common reduced form. Think about it; are we to believe that in a time when all other names and words were being reduced to remove unneeded extra letters, our name started out in a reduced form and was later expanded by Americans or English shipmasters by adding another letter? Of all the Irish names translated into English then later reduced to remove extra letters, only O'Kelly or Kelly were perfect in their original English translations? I think not. Our family name would have followed all the others, the early translations would have had more letters than needed just like all the rest but over time like other names it too was reduced to O'Kelly. I believe some American families may have resisted the reduction as a way to maintain some of the customs of their former home land and that is the reason some early Kelleys coming to America appear with the second "e" when the name was being reduced in Ireland and England but for my family how many "e"s or how we spelled out name seems to be moot as the evidence indicates they likely could not read and would had no ability to know the difference between the spellings and it wasn't until the second America born generation that we see our name taking the form it is today. It is difficult to know how the spelling of my families name came to be as Harold B Gill Literacy in Virginia states it wasn't uncommon for rural children to be taught to read but not taught to write so while my first American born members of my family made Xs or marks it is difficult to know if they could read and maybe spell their names. 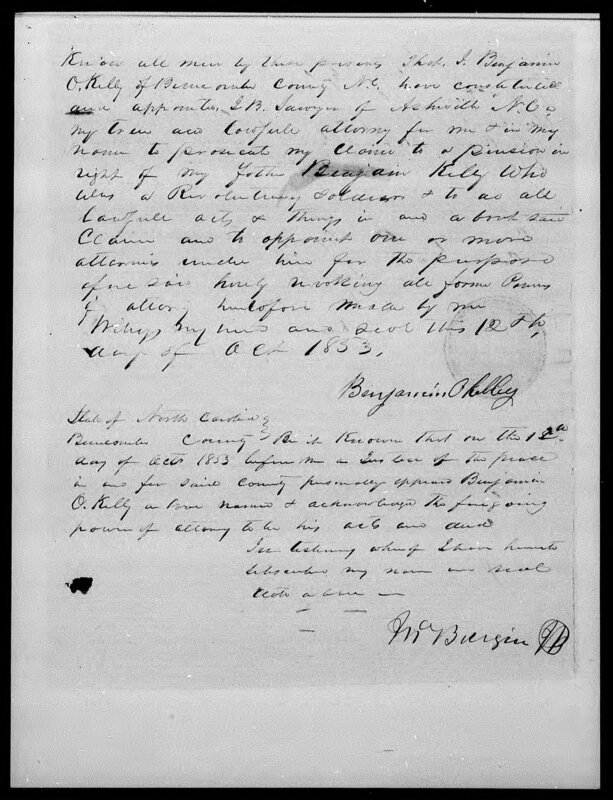 Rev James O'Kelly could read and write and we find him in a Mecklenburg Co VA deed dated Feb 8 1783 as James OKelly giving freedom to his 35 year old slave, Dinah. He appears again in 1790 records as Kelly but he appears as James OKelly in 1799 records so the spelling is determined by the person who is recording the name. Thomas said to have been born about 1750 appears in the records in North Carolina as Kelly but he appears in the 1800 Oglethorpe GA Census as Thos. OKelly so what ever caused either the addition or the return of the O to my family's name, it seems to have occurred after 1790 and before 1799 as we also find in Charlotte Co Va in 1800 a James OKelley who I suspect was the son of Rev James O'Kelly so it seems that not long after the O was added, the second "e" began to appear. Some claim that the second "e" was added in the 1800s to distance my American born protestant family from our Catholic cousin flooding into America but I suspect it had more to do with evolving American English language rules and it had nothing to do with how our ancestors names may have been spelled in Ireland or their protestant faith. Read my History of Irish names page for more detailed information about Irish naming customs and why names and words were reduced. Also my page Gaelic to English provides some common Gaelic to English information. The evidence to support my belief that the earliest spellings of O'Kelley can be found in many places. In the 1665 Co Antrim Hearth Money Rolls the researchers have given us both the modern spelling and the exact spelling as it appears on those 1665 records. More than a dozen appear as Kelley or O Kelley. There is one Mc Kelley and only a couple of O Kellys. Two out of more than this dozen have an apostrophe the rest have spaces between the O and Kelley. 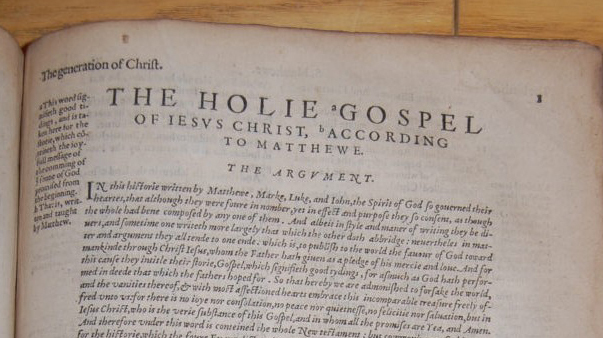 The English language has always been in flux, as a living language it is always changing and one can view this page from a 1577 Geneva Bible to see how words like Holy were once spelled as "Holie" just as Calley and Kellie transformed into Kelley and Kelly and much of this transformation occurred mostly because of the influence of the printing press which standardized the language and helped establish common spellings. What should be understood by the researcher is our name appeared as Ua Ceallaigh and later Ó Ceallaigh in our native Irish language and how it might appear in another language was totally dependent upon that language rules at the time of the translation and the training of the person doing the translation. If we find an English author translating our name as "o Kelley" that doesn't necessarily mean that our ancestor spelled his name in English that way if he used an English translation, it only means that the training of the person recording the name is being reflected in the spelling but if we find a government document, church record, or entry in an early family bible reflecting different spellings that may indicate that is how that ancestor translated and used his name in the English world at the time the record was created. The English during the reign of Queen Elizabeth actively used measures such as property forfeiture to force the land gentry Irish O'Kelley to use Kelly, the Queen believed the Irish customs and names were the cause of the disaffection the Irish had for the murdering and plundering English. The above provides us with an early example from an Irish government record of how some of the "old Irish" generation may have translated their name into English as early as 1627 when they used the double "e" spelling and how the younger generation reduced our name to the more modern single "e" spelling that is common in Ireland today. Charles Bridger's 1867 book titled "An Index to Printed Pedigrees: Contained in Country and Local Histories" gives us even more concrete proof as one can see this author is listing the pedigree for Col Charles O'Kelly's grandfather, Colla who was "O'Kelley of Screen" or a double "e" O'Kelley. He also lists single "e" O'Kellys making us aware there is a difference and this is not a mistake. Perhaps one of the most puzzling discoveries I have made is the current living descendent of Hy-Many descended from the O'Kelley of Gallagh yet the descendants of this line living in Ireland use the single "e" spelling. My family has a tradition that our double "e" spelling is how the old Irish spelled our name and because my DNA indicates that we descend from the O'Kelly of Breagh who lived on the north side of Navan in Co Meath, this tradition story may have some truth in it as these O'Kelleys would have used an English spelling before most other O'Kellys in Ireland because they lived so close to the English. The O'Kelly of Breagh took their O'Kelley surname from Ceallach (Kelley) mac Ailello the Abbot of Kildare when he became the Abbot of Kell in the mid 800 AD. The abbey at Kell was along the northern border of the O'Kelly of Breagh lands. There are some given names that appear in our family that have historic origins. George Washington O'Kelley is clearly named after George Washington. I do not find this name in use in the Gaelic Irish but it does appear in some of the Old English Irish. It likely that George Washington was the source of the name in our family. Benjamin F or Benjamin Franklins were clearly named after Ben Franklin who was very popular in America well before our revolution. As a publisher he was perhaps the best known American. I do not find this name in use in the Gaelic Irish, it was used in the Old English Irish, Rev John Chetwode's brother was named Benjamin. The Deans were of old English but because there are no Benjamin Dean O'Kelleys in our family I do not think this name originated from the Dean family. William has long been a popular name with the native Irish and the English. In Gaelic it appears as Liam. There are several very popular William O'Kelleys in Dr. O'Donovan's book about Hy-Many Ireland but these early Williams would have used the name Liam Ua Ceallaigh, Dr O'Donovan was writing a book for the English reader so he translated the Gaelic names into modern English spellings. Because William was so popular it should not be a surprise it is a name that appears in our American family. William is widely accepted among descendents as the Irish father of our ancestor who come from Ireland but because of a 1752 Lunenburg Co Tithe Census, 1769 Lunenburg Co Virginia Tithe Census, and a later 1782 Mecklenburg Co Virginia State Head of Household government census document and two Mecklenburg land deeds dated Feb 8 1783 that use William Kelly's land as the border description, I think it is certain that this was the name of our ancestor who came from Ireland. 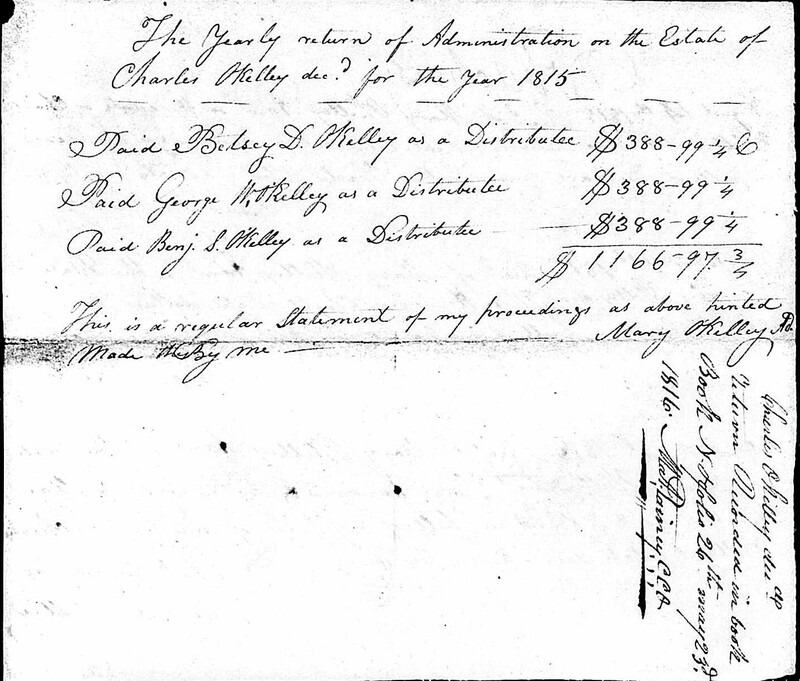 These are government documents, this is as good as it gets and the 1782 census occurred just three years after Charles Kelley appeared on the Mecklenburg Militia roster the same year his son, the first grandson to be born in America was born and Charles and Mary named him William. Charles does not appear in this head of house hold census nor does any of his brothers the explanation is he and his wife and two children were living as the native Irish were accustom, they all lived in the household of their mother and father, William and Elizabeth Kelley. Thomas was used in the native Irish but it appears as Tomas or Tomhas in the Gaelic Irish Catholic families. The Thomas spelling is an English spelling and I suspect it originates in our family from Thomas Dean the father of Elizabeth Dean who is said to have married our ancestor giving cause for the Dean name appearing as a middle name in so many descendants. A Thomas Dean appears in several land records in Co Prince George and Sury Virginia in the time when Elizabeth Dean's father would have lived. Francis does not appear in the Gaelic Irish that I can find. It does appear in the English. Francis Bacon was a famous Englishman who promoted the protestant plantation of Ireland by the Scots and English. Francis Drake was a famous sea captain and could have been the source as well. It is not a name one would expect to find in a native Gaelic family but because it appears most often as Francis Dean I suspect it originated Elizabeth Dean's family. Charles does appear in the 1600s in the Gaelic Irish family of Colla O'Kelley. Col Charles O'Kelley was the grandson of Colla and the 9th Lord of Screen. The O'Kelley of Screen family was deeply loyal to the English Royal family changing religions when the English Royals changed theirs but because we most often see Dean following the name I suspect it is a name that originated from the Dean family but Charles is a name that appears often in the Irish Newtown O'Kelly line but in the Co Sligo 1749 Elphin Census three Charles Kellys are found in the Co Sligo area. Dean is a middle name that appears often in our America family but I think its origins have been misunderstood. The Deans were one of the 14 tribes of Galway Ireland who originated from English and came to Ireland and established Galway during the Norman invasion of Ireland. Some claim that Elizabeth Dean was born in America and while that may be true, if our ancestor truly came to America about 1740 and married Elizabeth Dean then because of the contention between the English and Irish I think Elizabeth Dean would also had to been Irish born as it would be very unlikely her father would have permitted her to marry and Irish born man. If she was Irish born then I suspect she was born in Co Mayo or Co Sligo Ireland as many Deanes appear on the 1858 Griffith Valuation Census in Co Mayo Kilcommon Parish. The name James appears as Séamas in Irish Gaelic. Some native Irish have told me the James spelling was used only by the English or Irish protestant and was deeply hated by the Irish Catholic and this could be true as the Irish deeply hated King James for his plantation of Ulster and what they believed was his perversion of the true faith. The first Irish O'Kelly I have found was James O'Kelly an Irish Gentry died in the battle of Aughrim in 1691 and in the 1749 Elphin Co Sligo Census there are four James Kellys. Translated to Tuam Earliest known use of the double "e" spelling. Source William Brady in his 1876 book titled "The Episcopal Succession in England Scotland and Ireland Volume 2"
Promoted to Tuam Note- Early Irish priest married and had children. The double "e" spelling predates the printing press. Source William Brady in his 1876 book titled "The Episcopal Succession in England Scotland and Ireland Volume 2"
First printing press appeared in London and the London Publishers began to mass produce books greatly influencing language and spelling. I suspect because words became money, many spelling shortcuts were invented as to conserve valued space and make the language less complicated for the under educated. I also suspect this is the source of my family tradition that our family spelled the name O'Kelley as the "Old Irish" did, meaning the new Irish embraced the more efficient single "e" spelling. For my family to have been spelling O'Kelley in English there had to be a motivation. People don't just do this. I suspect our family may have been involved in trade with the English either as exporters or importers and just as the business class in China today learn English even in the time of our early ancestors, English was probably the language of money. They needed to be able to read and write English and have a name that could be written and read in English. If my theory holds true, I suspect we originated on the east coast of Ireland because that was close to the English trade but may have been forced to the west. Henry VII breaks with the Roman Catholic Church because the Pope would not allow him to divorce his second wife chiefly because she did not bear him a son. Henry commissioned the creation of his version of the Bible and he had a great number of his subjects tortured and killed when they refuse to embrace his new faith. This began religious strife that continues in Ireland today. Prior to this time the Irish mostly fought against each other seeking power and fortune. During her reign as Queen, many Irish lost their homes, their lands and their lives as the Protestant English Church sought to conquer and force its authority over the people of Ireland. Queen Elizabeth wrote him a letter offering to reward him with lands, manors, and title if he dropped the "O" from his name, learned and spelled his name in English and converted to Protestantism. This could be the line we come from as it would explain how our ancestor arrived in America as a Protestant and not the more traditional Irish Catholic which most Irish were at that time. It could also explain why he could have arrived with the Kelly name. Colla's line is well documented so if we descended from this line, we probably descended from a cousin or uncle of Colla. Colla lived at Castle O'Kelly near Galway Ireland and was the Seventh Lord of Screen (Scrine). He is the first confirmed Ceallach to change the family name to an English spelling and according to Charles Bridger's 1867 book that spelling was O'Kelley. King James Bible is completed. This was Version one with many revisions to follow. Many Kelleys arrive in Virginia from Ireland If the Kelley double "e" spelling was never used in Ireland as some native Irish claimed, where did all these early Kelley's come from? Are we to believe that very early on these were all misspellings? I don't think so, I think this is more evidence that very early Gaelic to English translations used the double "e" spelling and this is the source of my family's tradition story that we spell our name like the "Old Irish did". Publish his book Macariae Excidium and Dennis Henry listed O'Kellys, Kellys, and four Kelleys. Sir James Ware publish a book in Dublin Ireland titled "The Antiquities and History of Ireland" and in his book we find O Kelleys living near Galway and O Kelly as well as an O.Kelly living in Ireland before the time our ancestor came from Ireland. This opens the possibility that Family Tradition that O'Kelley is the old Irish spelling of our name could have some truth to the claim. The apostrophe was not used in the English language the way it is used now, you will find in the book where it is only used to denote the past tense of a word. The period was used at least once and a space between the "O" and the surname was the common way to display the name. It is believed that our ancestor was born in Ireland around Galway and arrived in America sometime in the second quarter of the 18th Century. I believe our ancestor descended from the Irish land owning Gentry class and he met and married Miss Dean while in Ireland and she is of the Galway Deanes who are one of the 14 tribes of Galway. They were probably married in Ireland and lived there and some of their early children could have been born there. I believe our ancestor may have come to America as Kelley probably because of the pact made between Colla Kelly and Queen Elizabeth or it could be of an earlier agreement. Such an agreement and a marriage to the Galway Deanes would explain how our ancestor arrived in America from Ireland as a protestant and why he would name many of his first America born children the names used by English Kings and Queens. I believe the 1782 Virginia Census of Mecklenburg VA proves our ancestor's name was William Kelley and it was not James or Thomas. Appear in Revolutionary War rolls serving with the 8th Virginia Reg as Kelly. Charles gravestone does bear the name O'Kelley but that was reportedly set by the Daughters of the American Revolution and they did not exist until almost 80 years after Charles's death and in a time when the O'Kelley name was well established and in use. Charles's wife Mary died in 1842 and by the time of her death the O'Kelley spelling of the name was more widely used so her gravestone can not be taken as fact. Appears on the Militia Roster for Mecklenburg Co Virginia. Newly married (1778) a new father, it appears he hired a substitute. Appears in the 1782 Virginia Head of Household Census for Mecklenburg Co VA with ten other people. Since Charles is married, living in Mecklenburg and has two children it seems clear that William is the father of Charles and they are living as was the Irish custom, everyone in the same home providing an explanation as to how Charles and his family could be living in Mecklenburng and not appear on this census. Appears on a North Carolina Militia pay voucher as Thomas Kelly. 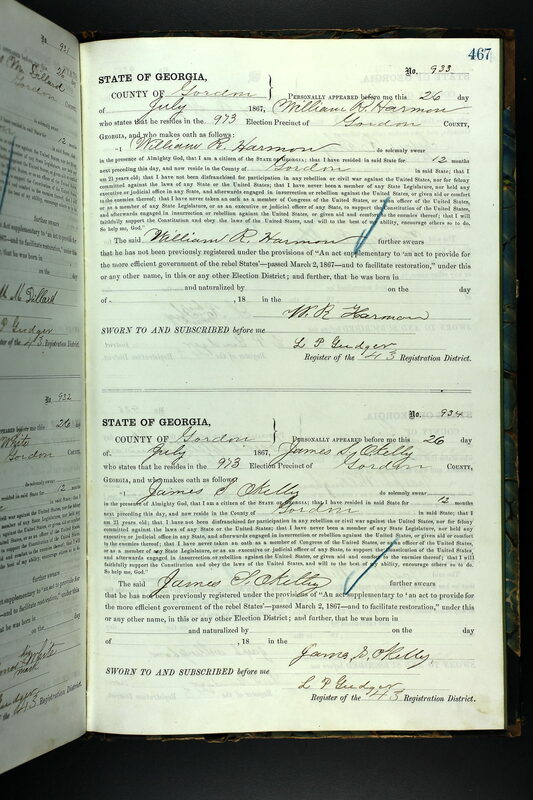 Appears as Kelley on the marriage record to Delilah Crowder. Appears in his Madison Co Will as Thomas OKelly. Thomas had to make his mark so it appears he and his wife were unable to read and write and that could have influenced how the name was spelled in the will. The widow of Thomas OKelly, she appears in Madison Co Census as an OKelly, but her son James appears on the line above her as an OKelley. I think it is very unlikely the census taker made a mistake as one can clearly see in the original census the histation mark the taker made as he paused at the place where the second "e" would have appeared in Elizabeth's last name as if someone was spelling it for him. Used Kelly on is American Revolutionary War Pension application. Benjamin made a mark on his application so it is unlikely he could read or write. Appears in an 1838 bible that appears to have belonged to Thomas his son. The name is spelled as O'Kelly. This appears to be the earliest Family Bible records. The grandchildren of Thomas O'Kelly appear in the 1838 bible pages as O'Kelley. 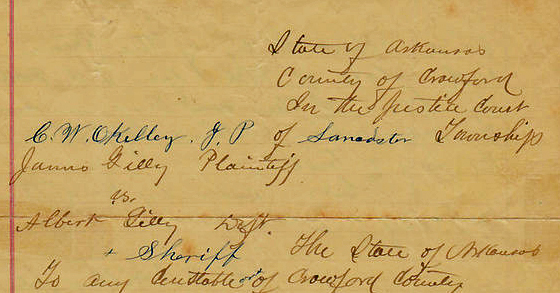 Was a Justice of the Peace in Oglethorpe Co GA and on May 7, 1842 he signed his name as James OKelley without the apostrophe. In almost every document Rev James is listed as O'Kelly. He died in 1826 and about twenty years after his burial his friends put a gravestone on his grave and it bears the name of O'Kelley. Appears in an 1850 NC Census as O'Kelly. A single bible page shows James D OKelly spelled with a single "e" and no apostrophe. James is buried in Oklahoma under the name of O'Kelley. 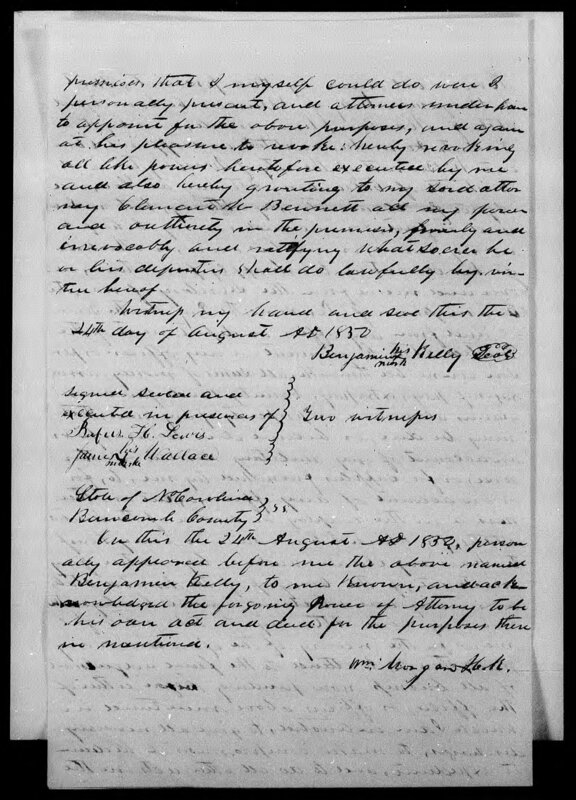 Signed an affidavit for his deceased father's Revolutionary War Pension application as OKelley. It is not known when Dr O'Kelley copied from an ancestor's bible the information he put on paper. Family tradition says he did it to include the information with his Civil War Pension application and a copy is suppose to be on file at the National Archives. 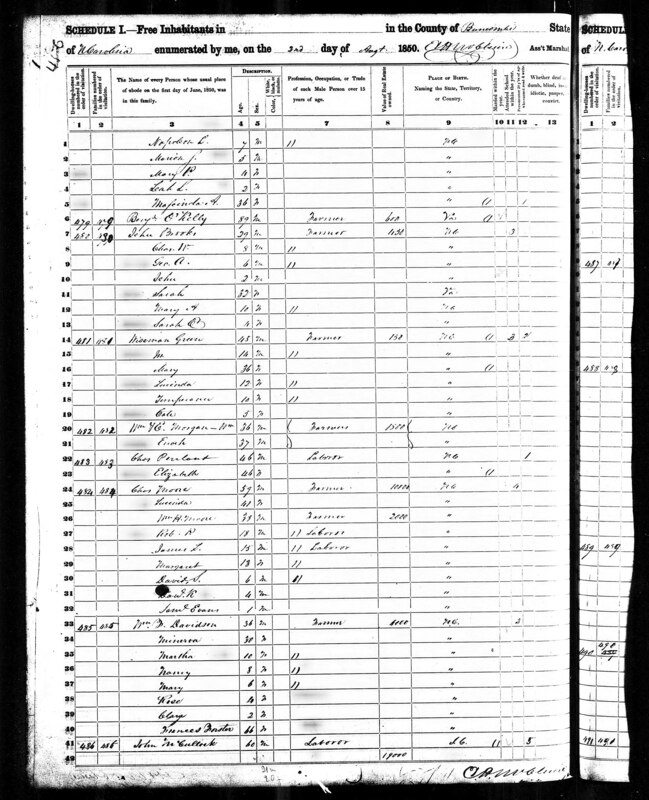 National Archive Records show his pension application was filed in 1904. Thomas and three of his brothers served together in the Union Arkansas Calvary during that war and National Archive documents show that all four spelled their name as O'Kelley. 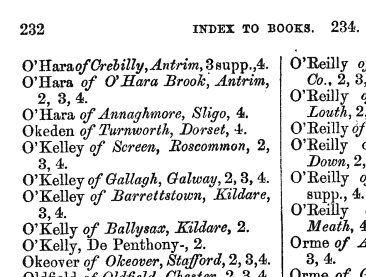 Purblishes his book "An Index to Printed Pedigrees: Contained in County and Local Histories" and on page 232 we find the family of Colla, O'Kelley of Screen, Roscommon. Signed his name on an Oath and he does not include the apostrophe. Descendent of Rev James O'Kelly appears in 1880 Fayette TN Census as an O'Kelley with both the double "e" and apostrophe. I believe it is very unlikely that two different census takers, one in 1860 and another in 1880 would have made the same spelling mistake. Justice of the Peace for Lancaster Township, Crawford Co Arkansas. He signed a complaint without the apostrophe. Here is a good explanation about Irish names. Here is a good explanation as to how and why surnames were transformed.